I need a little colour and fun this week so I’m playing along with Cee’s Fun Foto Challenge. These photos are all “ones I prepared earlier”. I do have my camera and my portable hard drive with all my photos on it with me at Ally’s house. As the weather is not very colourful, it’s been predominantly brown and ash grey, these photos are all reruns from various other posts. 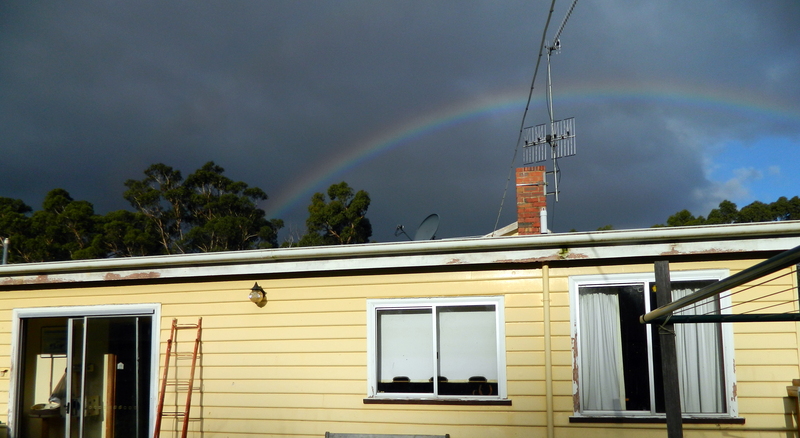 The rainbow could be seen across the road from my house. A sign you don’t want to see. Once again Snapshot Sunday has been foiled by more rain preventing me from getting out to take any new photos. Here are a few rain related pics from earlier in the year. It’s winter here in Tasmania. The days are short and the weather unpredictable. Some days, like today, it’s mild and sunny but others we don’t see the sun all day. The grey days are a bit depressing, mostly because of the lack of sunlight but I don’t mind a good downpour. I like the sound of rain on our galvanised iron roof and the sound of a thunderstorm. The other day I looked outside and the sky was as black as the ace of spades. 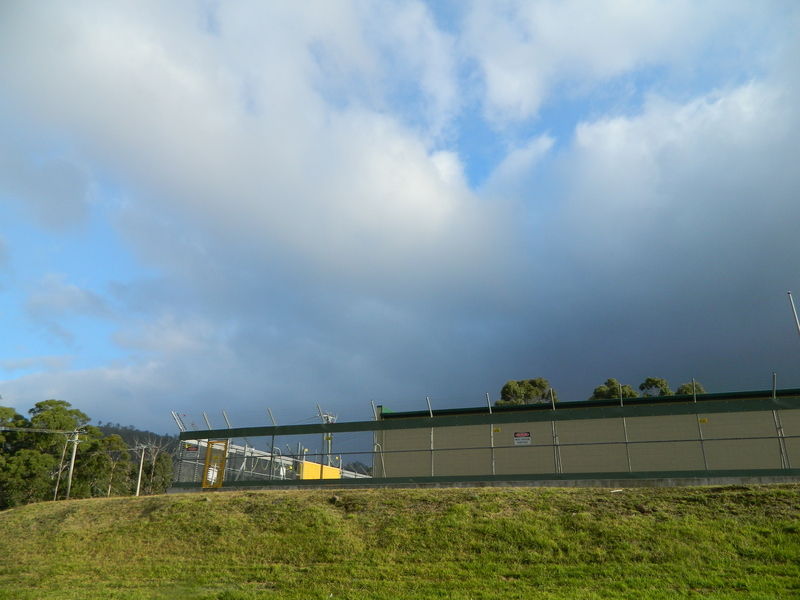 We live next door to an electricity power sub station and in this photo you can see the black clouds with just a few patches of blue. At first I thought we might get a heavy downpour or even a sprinkle of snow but instead there was a very light rain. I spotted a rainbow so I rushed back inside to get the camera and see if I could capture it. 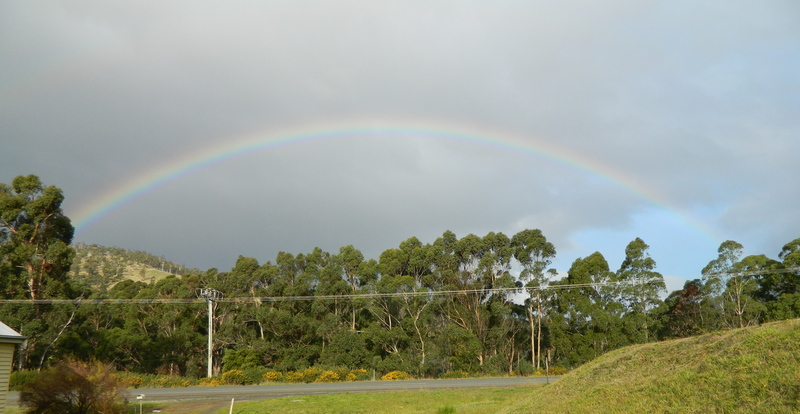 One of the things I like here in Tassie is that usually you can see the entire rainbow. I didn’t see that so much in South Australia, often you’d only see a part of it where I lived. I like rainbows. I think of the song “Somewhere Over The Rainbow” and of the pot of gold that mum used to say was at the end of it. I used to think that it would be wonderful to find it but soon realised that the more you chase a rainbow the further away it gets. That is until we came here. This is Rainbow’s End for me.